BBC America names Bramwell Tovey "British Expat of the Month"
In the world of classical music, it’s rather unusual for the conductor to have a friendly fireside chat with the audience before the concert begins, but for British conductor, composer and pianist Bramwell Tovey, making a connection with the hundreds or thousands of people out there seems to be an important part of his job. At work, rehearsal times are also something different. 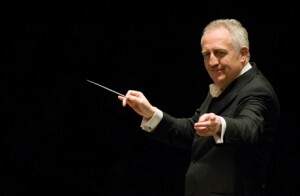 In the U.K. there is often only one rehearsal of three hours, while in the U.S. there are four or five rehearsals of 2½ hours duration for every program — something he feels that helps a conductor “take greater risks in performance and go a little deeper.” Finally, he says that standing ovations are a much more common occurrence in the U.S. than the U.K.